Tunila Omavel is a Dunmer healer who will take up residence at Tel Uvirith after you have built your stronghold. 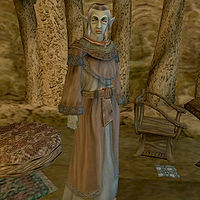 If you are a member of House Telvanni (of rank Lawman or higher - which you should be if your stronghold has been built), she will sell you potions and spells. If you are a member of House Hlaalu or House Redoran on the other hand, she will attack you (unless you exploited the loophole that allows you to be a member of both House Hlaalu and House Telvanni). This page was last modified on 23 November 2018, at 07:29.